"I first tried my hand at string art in 1993. I think." Those awkward pre-teen years in the late '90s all tend to blend together. For me it was a lot of awkward exchanges and waking up at 7 a.m. to record Sailor Moon on VHS. I lived with my three sisters, mom and grandma just north of Dayton, Ohio. It was a small township that consisted mostly of cornfields and cows with big tags clamped onto their ears that I still suspect indicated their doom. There wasn't a whole lot to do out there, so I spent my time exploring the house. My grandma collected rooms full of unused merchandise before Hoarders made it cool. One day whilst swimming through the back porch, I discovered a small white box with a parrot on the front. The string art kit was one of many manufactured by Open Door Enterprises, a company that saw a solid financial opportunity in the string art craze of the 1970s. It was designed by John Eichinger, one of the most prolific mid-century thread artists. But 13-year-old me didn't care about any of that. This box looked like something to do during a summer when my best friend Tiffany was busy a lot with her family. Also, her number had some zeros in it and those took forever to dial on a rotary phone. I didn't know what I was doing when I started my first string art project, which tells me now that you really don't need much to get started, either. The kit came with string, pins and some -ahem- lovely black felt. I would later learn that black felt was integral to the structure of all string art in the '70s. I can in no way account for why he doesn't have an eye?? With the help of the pattern, I was able to create a very intricate parrot design with my dumb little hands, probably pushing my giant glasses up my nose and periodically wiping the sweat underneath my Aladdin ballcap. If that hopeless nerd can do it, so can you. My grandma was so impressed that she didn't yell at me for taking one of her many treasures buried in a box alongside mouse turds and old phone books. Either that or she didn't remember buying it. That's a 50/50. I actually just rediscovered this piece last month after moving to Gulfport, Florida, where wild parrots fly by my house all the time. Full circle, mannnn. Why a book on geometric string art? 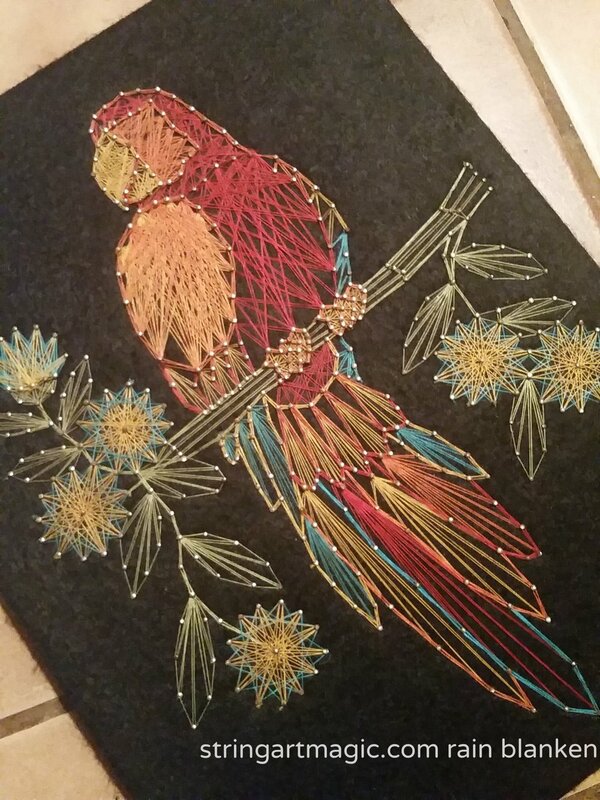 After that first flirtation with string art as a kid, I took a 20 year hiatus. The main reason? Beyond the old box I found at Grandma's, the world didn't have a lot to offer a budding string artist. The 'thread art' of the 1970s was a fad -- just like macrame. And just like macrame, it only lived in dusty pamphlets and books. A lot of the patterns I could find were dark depictions of sailboats and the same glaring owls. So string art in all forms disappeared from the 1980s till about 2010. Then it re-emerged in a boom as nail and string creations that used randomly wound string to color in the name 'Bently'. I was excited to see some incarnation of the craft I'd tried as a kid, but I knew string art to be something entirely different. Freeform 'Aloha' string art by Rain Blanken - Fun to string, but not exactly intricate. The new designs were a far cry from the pin-by-pin instructions that I followed religiously to create my funkadelic parrot. The new freeform string art designs felt a bit like coloring within the lines. They were cool in their own way, but I felt like I was in a bizarro craft universe because those beautiful geometric designs were simply lost and replaced with something else. When I looked into it, I found that geometric string art was all but dead. In the 1970s, string art was more like 'thread art' with thinner thread often used than the embroidery thread, yarn and para cord thread that is used in contemporary freeform designs. There were simplY no geometric string art books published past the early 1980s. None. I wanted to revive the old geometric style -- and blend the new with the old. I liked making freeform string art, but my geometric roots wanted something more intricate. I'm applying the repeating parabolic angles that created those signature '70s looks while working in those new and brighter freeform string art techniques. I also wanted to tell the story of the origins of string art, namely the contributions of a trailblazing feminist you've probably never heard of, Mary Everest Boole. If Claude Monet is the father of impressionism, Mary Everest Boole is the mother of geometric string art. I wanted to tell the world about Mary's contributions to both the education of women and the development of mathematics. Too many of our important women are subdued in the history books, so I really wanted to do my part to shed light on Mary's accomplishments. To do this, I contacted her family for an exclusive look at her life, including a never-before published photo of Mary for the book! String Art Magic book now available on Amazon!